1.1 Course Brochure means the current version of the Pink ElephantEMEA training and education brochure, which details the contents of Pink Elephant EMEA courses. 1.2 Course(s) means training and education offered by Pink Elephant EMEA and partners. 1.3 Course Fees means the advertised fees in the Pink Elephant EMEA course brochure. 1.4 Public Courses means a fixed schedule of courses taught by one or more instructors at a location determined by Pink Elephant EMEA. 1.5 Customer means any customer of Pink Elephant EMEA. 1.6 Course Venue means the location at which Pink Elephant EMEA presents its courses. 1.7 Course Documentation means the course handouts issued to each student. 1.8 Student means a person nominated to attend a Pink Elephant EMEA course. 1.9 Pre-Requisites Some courses require specific prerequisites which must be validated prior to course attendance. 2.1 Public Course fees include coffee on arrival, morning and afternoon refreshments, one copy of course documentation per delegate (where applicable), and writing aids and materials. Public course fees do not include accommodation. 2.2 VAT is payable at the prevailing rate for all courses held in the UK, irrespective of the nationality of the delegate. VAT can be reclaimed locally in any country, which is a member of the EEC. 2.3 Fee Changes Pink Elephant EMEA reserve the right to change course fees at any time. Bookings accepted on any courses before the notification of an increase in course fees will remain unchanged. 2.4 Examination Fees may be subject to change without prior notice. Pink Elephant EMEA reserve the right to pass on to the customer any increase in Examination Fees. 2.5 Credit Card Payment Fees may be applied for some credit cards, current details of these charges can been seen on booking form. 2.6 Discount Policy: Special offers on Course Fees made by Pink Elephant EMEA cannot be used in conjunction with the normal discount policy, where applicable. 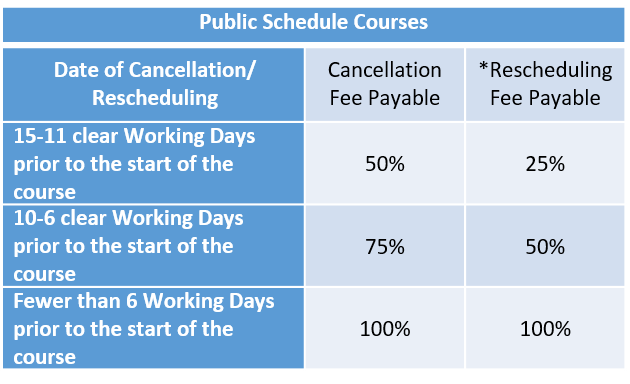 2.7 ‘Packaged’ Fees Where a series of courses are offered on a ‘Package’ basis – this means that, a) the package must be booked at a single time, and b) any deviation from the ‘Package’ make the ‘Packaged Fee’ void, and the Fees return to the standard Fees as advertised. 3.1 On confirmation of booking, a VAT invoice will be sent to Accounts Payable unless otherwise stated. 3.2 IT IS A CONDITION OF BOOKING THAT PAYMENT MUST BE RECEIVED BEFORE ATTENDANCE ON THE COURSE OR SEMINAR. Your place is NOT confirmed until payment is received. Cancellation charges will be made as follows: No cancellation charges will be incurred if notice of cancellation is received more than 15 working days before the start date of the course. A cancellation fee equal to the full amount of the advertised course fee will be charged if notice of cancellation is received less than 15 working days before the start date of the course. Postponement of a course or transfer to another date is treated as a cancellation and will adhere to the above terms. * Note you can only reschedule once. 5.1 Non-Attendance Should the delegate not attend a booked, or transferred, course then the full amount of the advertised course fee will be charged. 5.2 Substitutions Substitution of a delegate booked on a course by another employee from the same organisation may be made at any time without charges being incurred. Please note we must be notified of this prior to the course start date. 6.1 Pink Elephant EMEA reserve the right to alter any part of the published course programme, including date, presenter(s), venue, and content if it is necessitated by circumstances beyond their control. They will however use their best efforts to ensure the programme as altered remains as close to the published programme as possible. Pink Elephant EMEA shall not be liable for any costs incurred due to course changes. 7.1 The copyright of all documentation (including workbooks, handouts and exercises) issued during a course is the sole property of either Pink Elephant EMEA or the licensor as indicated in the material. Under no circumstances should documentation be copied, summarised or reproduced by any means without the written consent of the copyright owner. Should any illegal use of any materials be discovered, legal action may be instigated against the offender(s). 8.1 Whilst Pink Elephant EMEA and those in its employment make every effort to ensure that all information (verbal or written) provided during a course is accurate and correct at the time, we accept no liability for any claims in relation to loss of business or consequential damage incurred by a customer as a result of a student using information derived from a Pink Elephant EMEA course. It is understood that all information supplied to a student during a course is done so with the proviso that it is subject to the standards, procedures and codes and practices in operation at the individual’s place of work as defined by their employer. Therefore, should a student choose to perform action derived from information during a Pink Elephant EMEA course, they do so at their own discretion. English law shall govern the contract between Pink Elephant EMEA Ltd. and all of its customers. Neither party shall be responsible for failure to fulfill its obligations hereunder to the extent that this results from any cause beyond its reasonable control.